What kind of vehicle to pull a 33ft trailor? My husband and I are really interested in RVing full time and we just got an offer to trade one of our cars for a 33ft trailer. We were really hoping to get a class c RV, not a trailer, but its a good deal - however, I know pretty much nothing about any of this, so what kind of vehicle would we need to tow a trailer this size? We have a V6 station wagon, but I don't know if it could handle that kind of weight?? If anyone can answer fairly quickly it would be greatly appreciated, as we need to make a decision soon. Comments for What kind of vehicle to pull a 33ft trailor? It depends what type the trailer is. A regular pull behind could be pulled with a 1/2 to 3/4 ton pickup. If it is a 5th wheel, I'd say move up to a one ton pickup. We have a 37ft 5th wheel and find our truck handles it quite nicely. I am not sure but I would say no. It depends on the weight of the trailer, and what weight your vehicle can tow. 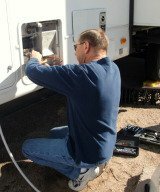 Check your owners manual or check with an RV dealer they would definitely help you. Good luck.